Connect RS232C serial devices such as barcode scanner, magnetic card reader with serial interface via this converter. - REX-USB60MB is a USB to serial converter. - Up to 230.4Kbps data transfer rate. - Micro USB (B type Male) connector. - The terminal application "USB60Term" published at Google Play. - Bus powered. no need external power supply. - Android tablet and smart phone with free Micto USB B type port. It must be USB Host mode are supported. this indicator LED will be on. 1. Do not remove while the application is communicating. System will be unstable. 2. Do not operate to suspend. System will be unable to resume properly. 3. 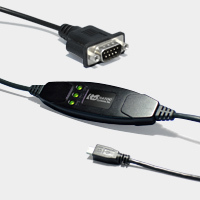 This product does not support the serial mouse for connecting to RS-232C port. The pin assignment of the connector.